Imagine you could turn a hollow sphere completely inside out – without making a hole, without cutting the material, without making any creases. If you could ever do such a thing, it would rely on a field of mathematics called topology. Kate Scardifileld’s current exhibition Soft Topologies at the UTS Gallery is an example of an artist using the metaphor of topology to make artwork and describe her practice. Scardifield’s primary media are textiles, though the exhibition is also a series of “adaptable sculptures” that will be transformed by the artist and a select, multidisciplinary team. The exhibition is a choreography of Scardifield’s attractively coloured textiles, which spray, flutter, fan, drape, hang and crumple through the space like escaped gestures. These forms are only one version of the installations, limited by the static state convenient for gallery viewing. 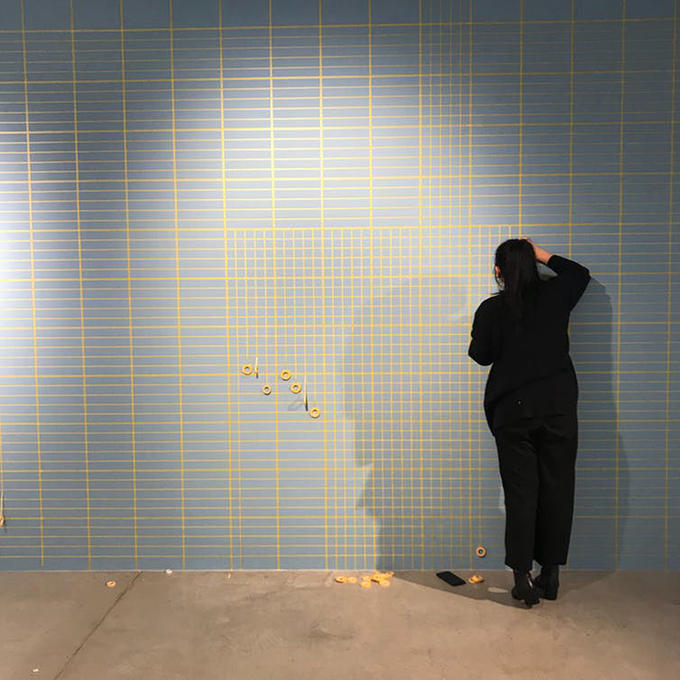 The far wall of the exhibition is covered by a grid of yellow tape against bright blue. It’s a comparatively rigid expression of space that offsets the dynamism and intricacy of the textiles scattered about the room. Combined with algebraic geometry, abstract algebra, differential equations and probabilities, topology is now used in many branches of physics to understand “exotic states of matter” – that is, states of matter that are not solid, liquid or gas and that have very unusual physical characteristics. Scardifield’s exhibition is an example of the way practitioners from different disciplines productively use ideas that originate in vastly different fields of study. Metaphors forged in one discipline happily circulate through others. “The cell”, for instance, is an architectural term that became common and influential in biological science, the study of social phenomena (terrorist cells) and technology (cell phone). “Immunity” is a term that originally had legal applications meaning “exception from liability”, which is now more commonly associated with medicine. Topology enables a different understanding of the relationships between things. Philosopher Ian Hacking suggests that the topological metaphor of a manifold is an improvement on the optical metaphor of a spectrum for capturing our present awareness of autism. A spectrum “misleadingly suggests a single dimension from severe to high-functioning” whereas manifolds, like kinds of autism, “come in any number of dimensions”. Topological metaphors are also useful for thinking differently about other relations that are conventionally conceived as spectra: left and right political, male and female gender. For example, thinking topologically enables the understanding that Greens supporters and Nationals, who are usually imagined to be at opposed ends of the political spectrum, might be aligned on certain issues, such as those to do with the fights against coal mines on farm land. Scardifield’s practice involves folding and distorting cloth so that it takes on a surprising variety of forms. She focuses on the relationship between change and continuity of form through operations of weaving, folding, draping, pleating and layering. These are analogous to the abstract manipulations and speculations that inform the mathematical field of topology. A flat piece of cloth is a classic, simple two dimensional space. 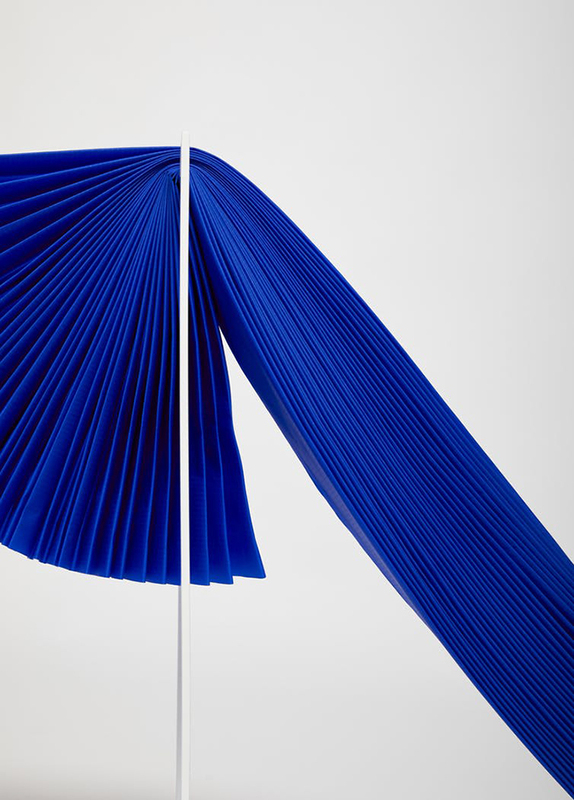 Three dimensional space of a more complicated nature is created when Scardifield deliberately folds cloth in pleats. 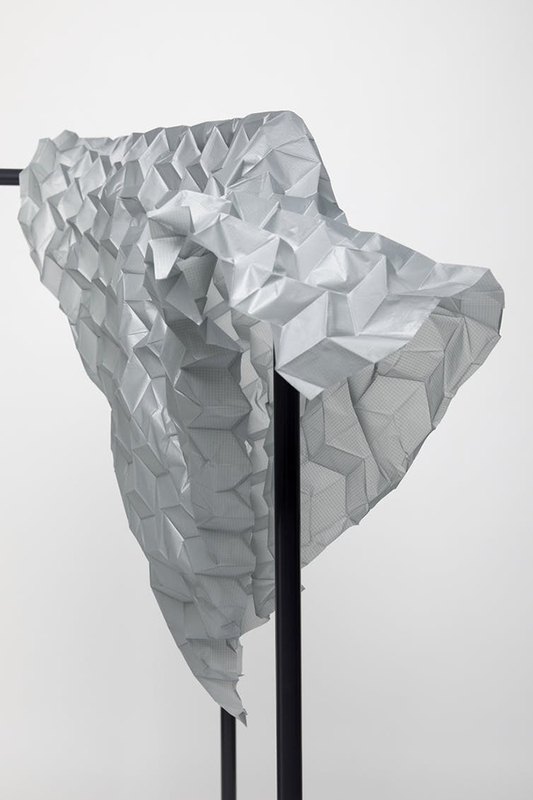 Folds of a more random variety are created in the exhibition by allowing the cloth to describe the forms of other objects (draping) or the forces of gravity and tension (hanging). The new forms created in these processes are at once distinct from and yet continuous with the original pieces of cloth. Author and academic Steven Connor suggests that “the labile, intermediary form of the textile” provides a better material metaphor for understanding “the contemporary world of communication and information” than previous alternatives of solidity or fluidity. Textiles are at once pliable and cohesive, and in this sense invite the imagining of forms that dance with subtle fluctuations over time. This is expressed in the following video of Scardifield making a chevron mould. The expression of space and form in terms of continuity and change is central to the individual objects in Soft Topologies and the overall design of the exhibition. Scardifield has deliberately designed the exhibition as a dynamic space, involving multiple participants from different disciplines who rearrange her works for the duration of the show and express her textiles through other media, such as video and photography. The traces of her work in different media are like the traces left by the folds Scardifield makes in cloth and paper to create new forms. Scardifield doesn’t use topological mathematics in her exhibition. However, the show is a great example of topology can invite different possibilities for imagining and analysis.